Diane Thielfoldt is co-founder of The Learning Cafe (thelearningcafe.net), a consulting firm dedicated to helping organizations develop, engage, and retain the talent of every generation. Also a workshop facilitator and an engaging speaker, she has educated hundreds of managers on issues involving the multigenerational workforce. She can be reached at TLC@TheLearningCafe.net. beginning in 2015, we will have five generations in the workforce. our life-stage dictate some of our needs and preferences. 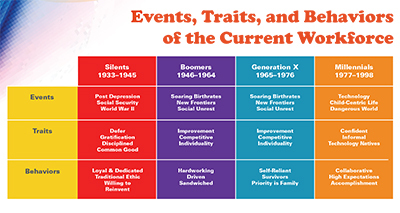 defy generalization, as they appear more diverse than the other generations. see themselves as vigorous, contributing members of the workforce. self-discipline, and postponing material rewards. preferring to think things through before taking action. “Zoomer” group, known for their preoccupation with “self”). competitive, and focused on personal accomplishment. confronted with younger employees who do not fit the mold that they created. highly committed to good bosses, stimulating projects, and capable peers. micromanaging does not work with them. start—their careers are fluid, with on and off ramps. Millennials bring to the workplace. learning, and fun are absent from their work. multitasking, having juggled school, sports, and social interests as children. those aged 75 and older, at a rate of 78%. group is currently unemployed or underemployed due to the economic downturn. competing for positions that are still limited. and will be for the rest of your career. found younger workers’ informality and need for supervision problematic. directly ask employees about their communication or work-style preferences. encourage Boomers to lighten up a bit and let go. formal and fussy, or taking too much of their time. individual employees, with a strong emphasis on providing feedback. these employees the opportunity to mentor others in your group. Millennials: Explain the importance of seemingly routine tasks. Set specific expectations, targets, and goals, and give plenty of feedback. Text them coaching tips or direction. underestimate their comfort with the Internet, email, etc. Boomers: Boomers also like face time and phone conversations. like plenty of hard data to help them make a sales decision. relies heavily on e-communications, including text messaging and social media. appreciation; reporting to a bad boss; and an inability to learn and grow. information about how to manage diverse employees, how can we be good bosses? makes an effort to build a climate that fuels engagement. commitments and appointments with employees. lunch with employees; take time to get to know each of them. your sense of humor, celebrate successes, and encourage relationship building. outdoor sports activities) with other teams or departments. leads with frequent feedback and communication. least once a month, tell people why and how their work is significant. express appreciation for each employee’s contribution. around, say hello, and greet people at the beginning of their day. with people in person, by email, phone, text, or instant messaging. positive messages (rather than “or else” statements) to inspire. Meet with employees once a month to discuss work. assignments, and tasks that could enhance their careers. What talents do you have that are not being used? assignments of interest to you? how to manage one’s career. need now to make sure they are prepared for the future. on any tasks that team members can handle effectively. enjoyment of work as well as that of your employees.